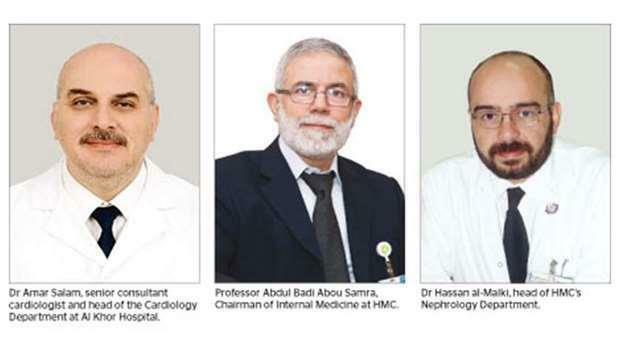 (MENAFN - Gulf Times) With Ramadan approaching, Hamad Medical Corporation (HMC) is urging patients with chronic medical conditions, such as diabetes, kidney failure, and heart disease to speak with their doctor before beginning a fast. Specialists from across the healthcare provider's network of hospitals say it is imperative that patients with chronic conditions, particularly those who require daily medication to treat their illness, seek medical advice before making any changes to their diet and medication regimes. Professor Abdul Badi Abou Samra, chairman of Internal Medicine at HMC, says diabetics who choose to fast, need to be aware of the potential health risks. He urges patients who plan to fast to talk with their doctors as early as possible before Ramadan begins, saying that while many diabetics can safely fast, modifications to diet, exercise, and medication routines are often required. 'Type 2 diabetics who have poorly managed blood glucose levels, patients with type 1 diabetes who take insulin, pregnant women who take insulin, and breastfeeding mothers who have type 1 or type 2 diabetes are generally advised not to fast. Patients with long-term diabetes complications, such as kidney failure or heart disease, are also advised not to fast. Your doctor can help determine if it is possible for you to safely fast, said Professor Abou Samra. He says for diabetics who do fast, it is important they monitor their blood glucose levels regularly and drink adequate fluids during non-fasting hours. He recommends water over juice and sugary beverages or options that include stimulants, such as coffee and caffeinated soft drinks. Professor Abou Samra also advises patients with diabetes to eat the Suhoor meal and he recommends resting before Iftar, but notes that sleeping during this period should be avoided as some patients may be at risk for hypoglycaemia. 'Patients with diabetes should speak with their doctor or health educator about when and how often they should check their blood glucose levels. As a general rule, a reading of 80-180 mg/dl post meal is considered safe and it is advisable to eat the Suhoor meal as late as possible. We also advise patients to refrain from strenuous workouts during Ramadan, particularly during the few hours before the sunset meal as this is when they are at risk for low blood sugar. Low-intensity activity is encouraged and performing prayers should be considered as part of the daily exercise programme, added Professor Abou Samra. Dr Hassan al-Malki, senior consultant and head of HMC's Nephrology Department, says for patients with kidney disease, the severity of their condition will determine if they are able to safely fast. He says while patients with acute kidney failure and those who have been diagnosed with stage three chronic kidney disease or higher should not fast, it may be possible for some patients with kidney disease to safely fast. According to Dr al-Malki, each patient's suitability for fasting should be evaluated by their physician. Dr al-Malki noted that abstaining from food and water can lead to dehydration, which can cause serious health complications for those with chronic kidney disease. He also stressed that kidney transplant patients should refrain from fasting due to their medication regime, which is required to keep the new organ working properly and the patient in good health. Dr al-Malki said patients who are undergoing hemodialysis to treat kidney failure will typically receive the treatment three times a week and cannot fast due to IV fluid intake during the procedure; however, he said these patients can normally fast during days they are not receiving hemodialysis. According to Dr Amar Salam, senior consultant cardiologist and head of the Cardiology Department at Al Khor Hospital, while it is necessary for heart patients to speak with their doctor before undertaking a fast, especially patients who require daily medication, most cardiac patients are able to safely fast. 'While fasting is not recommended for some heart patients, including those who have recently had a heart attack or heart surgery, and patients who have narrowing or inflammation of the aortic valve, research indicates that fasting is good for the heart. Fasting not only lowers one's risk for coronary artery disease and diabetes, but it can also cause significant changes in a person's blood cholesterol levels, increasing HDL-C, the ‘good' cholesterol by 30 to 40%. However, it is important for patients to consult with their doctor, especially patients who take medication and will require timing and dosage modifications, and potentially an alternative medication, says Dr Salam. Also an associate professor at Qatar University College of Medicine, Dr Salam adds that heart patients are advised to eat small portions during meals and to avoid fatty, salty, and sugary foods and large quantities of beverages. He suggests patients who drink caffeinated beverages ease into Ramadan by reducing their consumption of tea, coffee, and other caffeinated beverages prior to Ramadan. He says going without caffeine for long periods of time during Ramadan can cause withdrawal symptoms such as migraines and can be a shock to the system. HMC is asking patients who are unable to attend their appointment as a result of their Ramadan-related commitments, to call Nesma'ak at 16060 so the appointment can be rebooked. This will also allow the appointment slot to be assigned to another patient. The Ministry of Public Health, HMC, and Primary Health Care Corporation (PHCC) wish to remind members of the public about the Ramadan Health website and companion smartphone and tablet app. The Ramadan Health website is Qatar's first online resource devoted to health and wellness during the Holy Month. Visit the Ramadan Health website at www.hamad.qa/ramadanhealth, or download the app to your phone or tablet by searching for ‘Qatar Health' (available for iOS and Android operating systems).